Chicago Archdiocese Nixes Plan To Burn Rainbow Flag - Joe.My.God. In a Sept. 2 Sunday bulletin, Resurrection Catholic Church Pastor Fr. Paul Kalchik announced in a post-script to his re-printed Homily message that a Rainbow flag found in the church, along with parishioner’s pledge cards mixed with incense, would be burned in front of the church as a sacrilege during a prayer service following the Sept. 29 Feast of Saints Michael, Gabriel and Raphael 4:30 p.m. Mass. Kalchik’s homily was published in full by the extremist Catholic site Church Militant, which was founded by comically bewigged alleged ex-gay Michael Voris. What, you might be wondering, do the faithful remnant need to do today? Firstly, pray, pray for the strength to remain faithful during these trying times, but also for the restoration of an orthodox Roman Catholic Church, and not some denigrated semblance of it run by some bad bishops. The focus must always be on bringing people to Christ and saving souls. We cannot let the current troubles keep us from our mission to go make more disciples for the Lord, nor should modern day distractions like global warming, LGBT “rights” or even immigration issues ever take precedence over that mission. 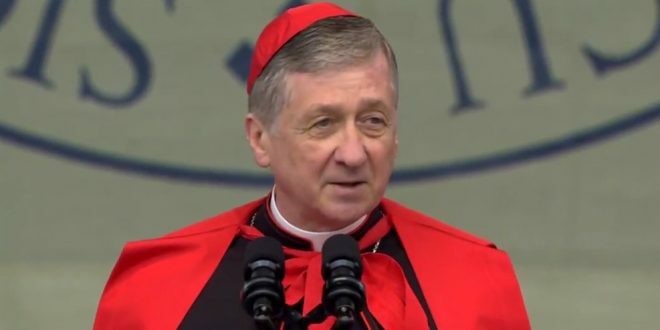 The photo above is Chicago Archbishop Blase Cupich.